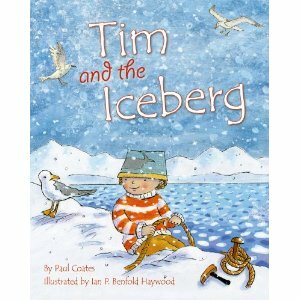 On a very hot day at the beach, Grandpa's tales of the frozen north pique Tim's sense of adventure. So off he sails in his toy boat to bring back an iceberg as a surprise for Grandpa. Along the way, he meets whales, seals, seagulls, even friendly oil riggers. Once in the icy north he ties an iceberg to his sailboat and heads home—but icebergs don't travel well. When Tim arrives back at the beach the surprise is not what he expected it to be! 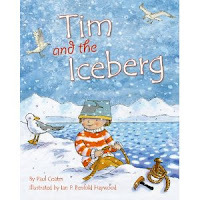 In this book, a little boy goes on an adventure to find an ice burg that his Grandpa told him about. I would have loved for the grandpa to go with him, or for him to find some interesting creatures along the way...which is illustrated on each page. The ending was pretty cute...but you are still left to wonder if the adventure to the North Pole actually happened or not. Even though this book was less than 15 pages in length, the text seemed to be a little long at times. Overall, the illustrations were very pretty to look at, but the dialogue was a little too long for my liking. I would recommend this book for preschool age and up...if you would like to buy this book, you can click on the title link above to purchase it on Amazon.